New York Times informs Republican candidate it will not take down article quoting two women who claimed they were touched by him. 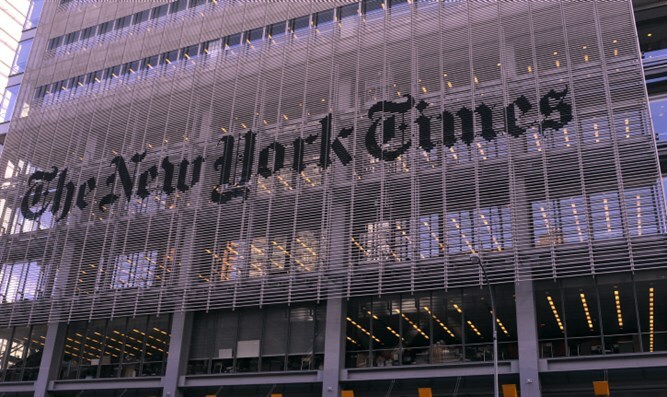 The New York Times on Thursday refused to back down from its report quoting two women who claimed to have been inappropriately touched by Republican presidential candidate Donald Trump. The newspaper responded to a warning from Trump's lawyers demanding the news organization take down the article, published on Wednesday. Trump has denied that the alleged incidents ever took place and accused the paper of libel, threatening to pursue legal action against the paper if the story is not retracted. The Times is refusing to take any such action, detailing in a letter from Times VP and Assistant General Counsel David McCraw to Trump's legal team why it believes that the story should not be considered libelous, ABC News reported. "Mr. Trump has bragged about his non-consensual sexual touching of women. He has bragged about intruding on beauty pageant contestants in their dressing rooms… Multiple women not mentioned in our article have publicly come forward to report on Mr. Trump's unwanted advances. Nothing in our article has had the slightest effect on the reputation that Mr. Trump, through his own words and actions, has already created for himself," the letter quoted by ABC News reads. The newspaper further argued that it was a public service to publish the story. "It would have been a disservice not just to our readers but to democracy itself to silence their voices. We did what the law allows: We published newsworthy information about a subject of deep public concern. If Mr. Trump disagrees, if he believes that American citizens had no right to hear what these women had to say and that the law of this country forces us and those who would dare to criticize him to stand silent or be punished, we welcome the opportunity to have a court set him straight," the letter reads. Trump earlier on Thursday directly addressed the article in question during a rally in Florida, appearing to suggest that it was produced in collusion with the Clinton campaign. "So now we address the slander and libels that was just last night thrown at me by the Clinton machine and New York Times and other media outlets as part of a concerted coordinated and vicious attack," he said, according to ABC News. "These vicious claims about me of inappropriate conduct with women are totally and absolutely false. And the Clintons know it. And they know it very well. These claims are all fabricated. They're pure fiction. And they're outright lies. These events never, ever happened," added Trump.